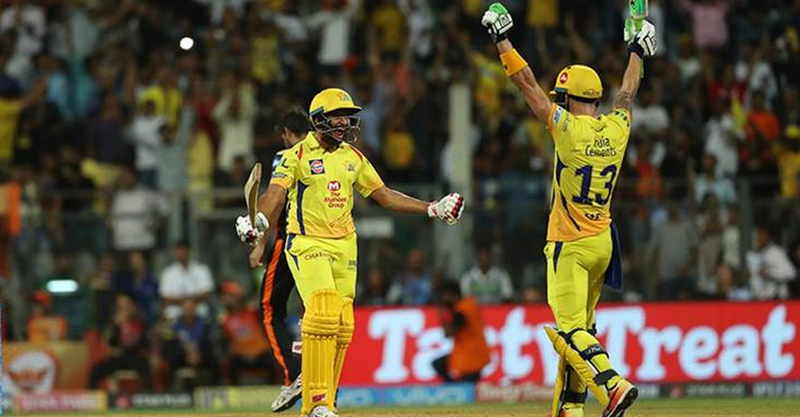 Two-time champions Chennai Super Kings marched into the final of the Indian Premier League (IPL) after Faf du Plessis smashed 67 not out giving up thrilling two-wicket victory against Sunrisers Hyderabad on Tuesday. Chasing 140 to reach the final for the seventh time, Chennai were gasping at 62 for six when South African Du Plessis mounted a spectacular counter-attack to see them home with five balls to spare at Mumbai’s Wankhede Stadium. The opener scored the winning run with his fourth six, which must have pleased skipper Mahendra Singh Dhoni who had sealed India’s victory in the 2011 World Cup final against Sri Lanka at the same venue in a similar fashion. Hyderabad can still make Sunday’s final, for which they will need to beat the winner of Thursday’s eliminator between Kolkata Knight Riders and Rajasthan Royals. Table-toppers Hyderabad had made it a habit of defending low totals in the group stage and once again their bowlers blew away the top half of Chennai’s batting order quickly to give them an upper hand. Siddharth Kaul (2-32) dismissed Suresh Raina (22) and Ambati Rayudu in successive deliveries to force Chennai onto the back foot in the fourth over. In-form Afghan spinner Rashid Khan (2-11) deceived Dhoni (9) with a googly and dismissed Dwayne Bravo for seven to further peg back Chennai. Watching the meltdown from the other end, Du Plessis then took the onus on himself to put Chennai’s chase back on track and he got good support from number 10 batsman Shardul Thakur who made 15 not out from five balls. Wary of the dew factor later in the evening, Dhoni had earlier opted to field against 2016 champions Hyderabad and paceman Deepak Chahar gave Chennai a perfect start by dismissing opener Shikhar Dhawan for a first ball duck. Hyderabad captain Kane Williamson, lone foreigner to lead an IPL team this season, hit four crisp boundaries in his 24 but they kept losing wickets at regular intervals. Yusuf Pathan contributed 24 but it was Carlos Brathwaite’s 43 not out from 29 balls that helped Hyderabad post 139-7, however it was not enough in the end.